Inventory We are a resale marketplace, not a box office or venue. Ticket prices may exceed face value. This site is not owned by Shrine Auditorium . 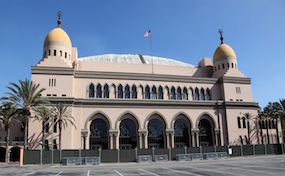 The Shrine Auditorium in Los Angeles, California is an incredible example of Moorish architecture. In 2002 the Auditorium was updated with all of the state of art features that today's discerning customers require. With seating for 6300 fans the Shrine Auditorium and Expo Hall provide ample accommodations for larger acts without losing the intimacy of a smaller venue. The Shrine Auditorium has hosted many famous award shows such as the Emmy's, MTV Video Music Awards, BET Awards, and the Teen Choice Awards. In 2016 Van Morrison will grace the hallowed halls of the Shrine Auditorium and have two concerts. With an eclectic balance of shows and concerts the Shrine Auditorium has become a great option in the Los Angeles entertainment scene. AuditoriumLosAngeles.com is a privately held company that specializes in the online sale of tickets in the secondary market. We are not affiliated with any primary box office or official site. We are a privately owned and operated company that concentrates in all online sales in the secondary ticket market. Prices tend to be above face value and will fluctuate quickly with demand. To purchase tickets to all Shrine Auditorium Expo Hall Los Angeles events at anytime simply click on the event you wish to attend or call our operators at anytime.